While some industries and many individuals continue to struggle, 2017 saw the job market get even stronger. Unemployment reached record lows and despite two major hurricanes and an uncertain political landscape, the economy added 1.9 million new jobs as of November. In some professions (though not all), this has led to what could be described as a war for talent. That's true in some technology jobs, healthcare, e-commerce, and key professional services, according to data from Glassdoor. In fact, as the year comes to a close, the jobs and recruiting site reported that there are a record 6.1 million open jobs in the United States today. That does not mean the labor market is all good or in any way stagnant. The types of workers needed has begun to change. That's something Glassdoor's Chief Economist Andrew Chamberlain addresses in the company's What's Ahead for Jobs? Five Disruptions to Watch in 2018 report. "Although the nation's labor market is strong heading into 2018, average wages for many remain stubbornly flat and a stark divide remains in who benefits from continued job growth, with tech skills earning a premium and many other jobs facing significant changes with the rise of AI and automation," said Chamberlain. Automation is already changing the job market. Image source: Getty Images. What five trends are on tap? If you are currently in the workforce or plan to enter it or change jobs in 2018, there are some things you need to know. Not all of these will have an immediate impact in the new year. Some will take time while others are already becoming evident. 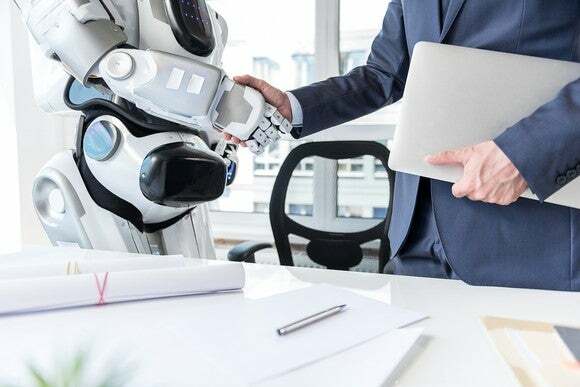 AI is changing the future of work: In 2017 we began to see hints of this with fast food chains adding ordering kiosks and warehouses using automated order pickers. This trend will accelerate in the coming year. Modernization of mobile job applications: In general, while it's possible to apply for some jobs from a mobile device, it's not practical. That's going to change as companies create tools to reflect how people use devices. Job growth in healthcare, technology, and labor-intensive roles: As the U.S. population ages, demand for healthcare workers will increase. Technology job growth has already started and labor-intensive jobs -- specifically ones that don't make sense to automate -- will grow as well. Increased transparency in the application and interview process: Under the current system in many cases, a person sends off a job application only to be kept completely in the dark. "In 2018, job seekers can expect more visibility into both the application process and the status of job applications in real time" according to Chamberlain. Encouraging employee passions through role experimentation: Essentially companies are finding ways to create more-specific jobs outside the traditional structure in order to support and retain employees. These positions put workers in place that both suit their abilities and nurture their passions. It's also worth noting that in 2018 Glassdoor expects the growth of technology jobs to move well beyond the technology sector. Expect this to specifically impact retail, finance, manufacturing, consulting, and even healthcare. It's important to conduct an honest assessment of your current skills and the changing direction of the workforce. There's no profession where ongoing training is a bad idea, but in some it's essential. In other cases, workers need to understand where their current skills will leave them as the labor market changes. For example, truck driver is an in-demand job right now, but it's also a profession that could be automated in a number of years. Other professions, like some retail and fast food workers, face potentially losing their jobs to automation even sooner. No matter what you do these trends are likely to impact you. Because of that, it's always better to get ahead of the curve rather than trying to learn new skills after the job market has already moved on.